Fans cheer during a friendly between the United States and Nigeria in Jacksonville, Florida. How much have Americans warmed to soccer since the previous World Cup? Quite a lot, you might guess, from the media’s extensive coverage of the World Cup (including this site’s). Some media reports about growing U.S. interest in soccer indicate the same. But are they borne out by the data? I looked at indicators of American soccer interest in April and found a mixed bag: Some measures — such as participation — were flat, while others, such as percentage of Americans who say they are fans of professional soccer, have risen. Thanks to suggestions from readers and colleagues, we now have a bit more to go on — and a similar mixed picture. For instance, media reports have said that Americans trailed only Brazilians in number of World Cup tickets purchased. U.S. fans have bought nearly 7 percent of the tickets sold so far, up from less than 5 percent in 2010. But the 2010 World Cup was in South Africa, whose capital is twice as far from the U.S capital as Brazil’s is. That’s also a good reason not to read too much into the very strong ratings (but not as strong as those of the NBA Finals) enjoyed by ESPN (FiveThirtyEight is a division of ESPN) and Univision in the U.S. The match times are more conducive to U.S. viewing because the Cup is being played in the Western Hemisphere. Raw ticket-sale numbers also don’t account for the population of the U.S., which is much greater than that of most of its top competitors in the ticket tables. Based on the United Nations’ 2014 estimates of population by country, the U.S. bought just six-tenths of a ticket per 1,000 inhabitants — far lower than the per-capita number in Argentina, Colombia and Chile. Germans also bought more tickets per capita, despite being much farther from Brazil. And Australians — who had to travel more than twice the distance to Brazil as Americans did, and whose national team is one of the worst in the competition — bought more than three times as many tickets, per capita. TV ratings for other soccer competitions also don’t provide much evidence for a surge in U.S. soccer interest. ESPN Research & Analytics, pointed out that Premier League matches got more network TV dates through their new broadcast partner, NBC, while Champions League matches got more potential viewers by switching to Fox Sports 1 from Fox Soccer.) 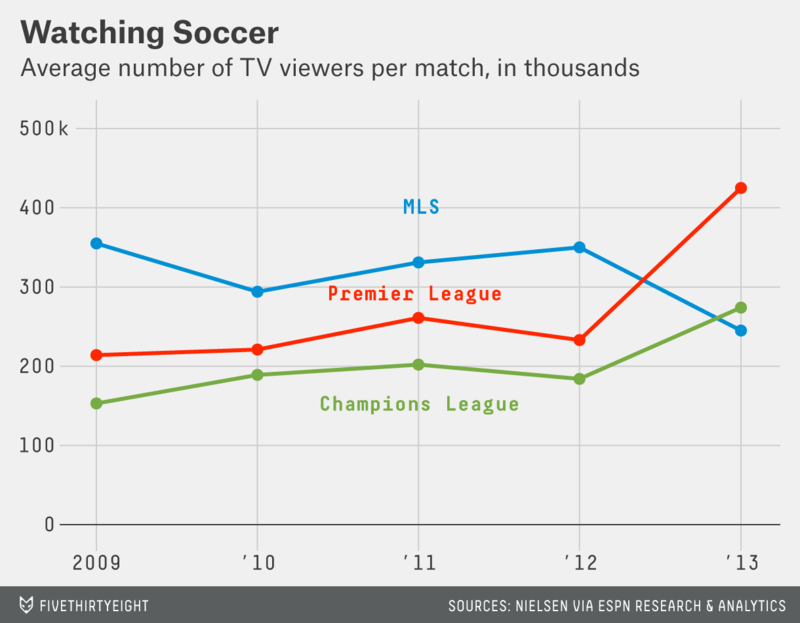 None of the three leagues averaged even 500,000 U.S. viewers for televised matches. One promising indicator is MLS’s surging merchandise sales, relative to other sports with comparable followings. 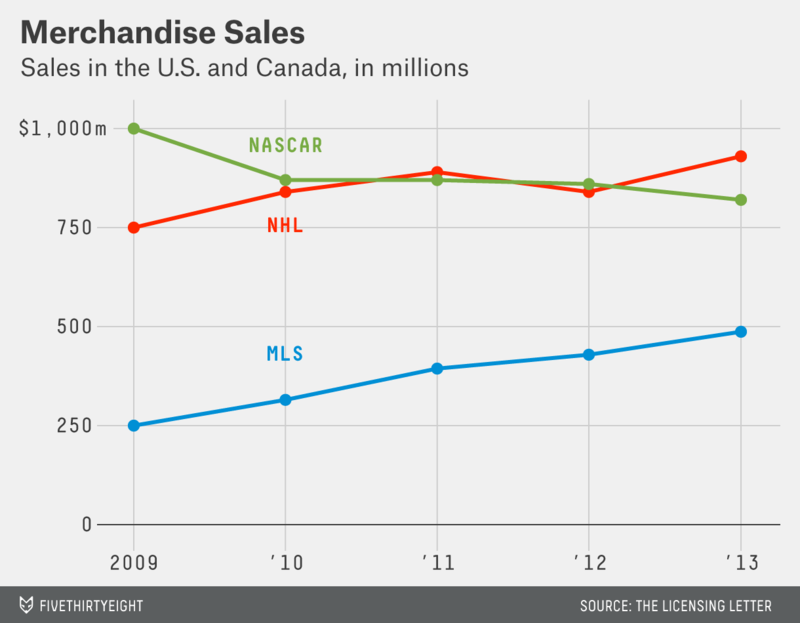 Sales nearly doubled in 2013 from 2009, compared to a 24 percent increase for the NHL’s merchandise revenue and an 18 percent decline in NASCAR’s, according to the Licensing Letter. All these indicators from pro soccer can only go so far in predicting World Cup interest. The tournament awakens the many dormant American soccer fans who go into hibernation for the four years between Cups. According to last month’s ESPN Sports Tracker, 39 percent of U.S. sports fans expressed interest in the World Cup. About 15 percent of those World Cup enthusiasts, though, don’t consider themselves pro-soccer fans.